'Skeleton in the Cupboard', written by Tony Wilmot, is episode one (of ten) in the ninth series of drama Tales of the Unexpected. It was produced by Anglia Television and first broadcast on Friday 18 December 1987 (ITV, 9:30-10pm). 'Skeleton in the Cupboard' is a characteristically unsettling, macabre episode of Tales of the Unexpected, the long-running series inspired by Roald Dahl's chilling short stories. Zoë plays Margaret Smythe, the unhappy wife of successful, ruthless businessman Robert. 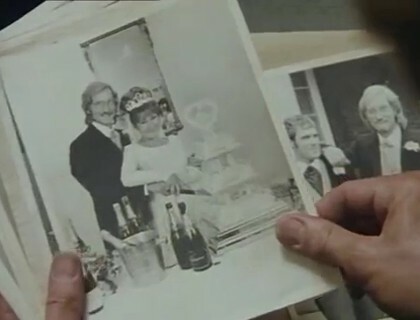 Throughout the couple's twenty-year marriage, Margaret's husband has harboured a terrible secret about an event that took place on the morning of their wedding day. Nobody, not even his wife, knows about the skeleton in Robert's cupboard. Could that be about to change? Without a career or children to occupy her time, Margaret attempts to conceal her boredom and restlessness from her husband by spending her days gardening at the Smythes' large, isolated house, near the seaside resort of Birchtown. When Robert arrives home unusually early from work, in an agitated state, Margaret suspects that something is badly wrong. The source of Robert's anxiety is a letter given to him by his colleague, Henry Traile. Reading the letter, written by a young woman called Jane Fisher, who is renting a room nearby, Robert realises that the secret he has kept since the 1960s may soon be exposed. He follows Jane while she looks for information about a member of a defunct, local MG Owners' Club and tries to prevent her from discovering that he is in fact the person for whom she is searching. When Margaret finds Robert looking through the couple's wedding photos, she cannot understand why her unsentimental husband should suddenly be dwelling on the past. Long-buried tensions resurface, and the extent of Margaret's unhappiness becomes clear. 'I don't want to spend another twenty years of my life trimming roses!' she screams at Robert. With his comfortable existence under threat, Robert takes drastic action to avoid having his twenty-year-old secret uncovered by Jane. Just as he begins to think that his problems are at an end, however, he discovers that Margaret has a secret of her own that may yet bring about his downfall. This final revelation provides the kind of shocking twist in the tale for which Tales of the Unexpected is celebrated. The year after appearing in 'Skeleton in the Cupboard' as Margaret, Zoë played a similarly unhappy wife in The English Programme - 'Five Stories of an Hour'. Like 'Skeleton in the Cupboard', the programme explores some of the difficulties of married life and delivers a shocking twist in the tale. 'Beautiful acting and strong direction' are in ample supply in 'Skeleton in the Cupboard', according to The Stage. 'Skeleton in the Cupboard' is included in the Tales of the Unexpected: Set 4 Region 1 DVD and Tales of the Unexpected: The Complete Series Region 2 DVD. The programme has also been released on video, but that item now appears to be quite difficult to find.